Don’t Miss This Blog Post! If you have been waiting for a fascinating, entertaining blog post that will give you the inside skinny on surprising new developments in my life, and how those newsworthy items are relevant to YOU, well I’m here to shed a little light on the situation. You’ve come to the wrong place, I’m very sorry to inform you of that fact. I have absolutely nothing NEW and EXCITING to relate, but of course if you want to get an update on some old, exciting news, why you are very welcome to check that out. 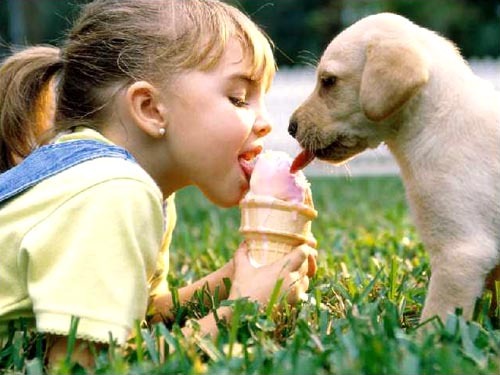 If, however, you have been DYING to find a cute photo of an adorable little girl and a delightful little puppy sharing an ice cream cone, YOU HAVE HIT THE JACKPOT. And yes, you will be very glad that you have not missed THIS BLOG POST as it contains the very photo you have been looking for. And you are very welcome to stay as long as you like. This entry was posted in Uncategorized and tagged award, mystery, novel, random. Bookmark the permalink.